Since we have now passed the mid-point of the 2018-19 season you may join for the remainder of the season for just £12. Click here to pay via Paypal and join online. 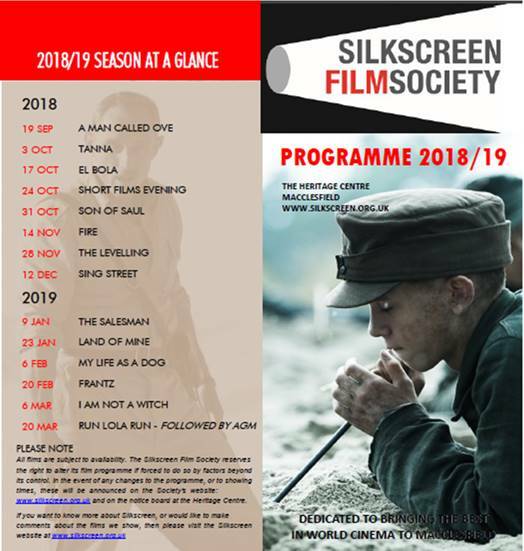 Silkscreen attracts all sorts of people, and membership is great value for money and still just £24 a year, allowing you to watch a rich pick of international films on the big screen for less than £2 per film. The price includes admission to our Short Films Evening, and also entitles you to a discount at Cinemac here at the Heritage Centre. The one thing members have in common is that we love a good film, whatever its style or origin. In the past few years we have built up to well over 400 members, with the great majority renewing each season. Every member from the previous season is sent a renewal letter and the forthcoming programme in early summer. New members can join any time . Print and fill in our membership form and send it to the membership secretary with your cheque or click here to pay via Paypal and join online. Want to give Silkscreen a try or come to see a particular film? Although we are a film society, you can visit as a guest any time for £4 provided you are accompanied by a member. If you do not know one and would like to come along as a guest, we will be happy to welcome you as long as we know you are attending. Please contact the membership secretary using the form on the Contact page.